#BREAKING: All adoptions of BLM Mustangs are on hold during the government shutdown. Those BLM employees in offices aren’t working but wranglers are feeding and watering the captive wild horses! We have confirmed there is a stop work order on all roundups! So no roundups will occur during the government shutdown. We urge public watchdogs to lawfully photograph the captives to ensure their safety during the government shutdown. Will Bureau of Land Management staff be scooping up the dead horses in the morning as usual with the shutdown? Is this the time to expose how many wild horses are dying in the captive pens? Please help us continue our work to Protect and Preserve native and wild horses with a donation because every dollar counts. Click www.PayPal.me/ProtectMustangs Thank you and Bless you. Together we can turn this around! Yellow journalism in Wall Street Journal pushing pesticide as “birth control” on wild horses? Dear Mr. Bunge: Regarding your article — They Shoot Horses (With Birth-Control Darts), Don’t They? — here are facts to correct the lies and disinformation you have been told. Sting of the dart: If it were only a sting! Fact: Many wild horses develop an abscess at the dart-injection site. Bogus ballooning population: Wild horses are a slow-growth species when it comes to reproduction. The gestation period lasts 11 months, and a mare produces just 1 foal. While an independent study of BLM’s records confirmed an almost 20% birth rate, that study also found that 50% of foals perish before their first birthday. Thus, the effective increase in population from new foals is just 10%. But adult mustangs also die. They succumb to illness, injury, and predation at a rate of at least 5% a year. So, what is a normal herd-growth rate? About 5%, probably less. Fraudulent figures: The Big Lie of “overpopulation” is the pretext for BLM’s war against the wild horses, and the wild horses are prisoners of that war. It’s BLM’s version of the “Shock Doctrine,” wherein BLM concocted a phony crisis to push through policies antithetical to the Wild Horse Act against the will of The People. There is no overpopulation except on BLM’s falsified spreadsheets. Reviews of BLM’s population-estimates reveal biologically-impossible herd-growth rates. For instance, in Utah, BLM claimed that the Conger herd grew from 156 horses to 285 horses in one year, an 82.7% increase, to which BLM tacked on another 20% by counting the unborn foals — the fetuses. In Wyoming, BLM declared that the Salt Wells Creek herd grew from 29 horses to 616 horses in 6 months (yes, months), a 2,024% increase. BLM’s “data” is chock-full of such preposterous growth-estimates. So, when you hear talk of how the wild horses are reproducing “exponentially,” that’s a sure sign that BLM has falsified the data. Wild horses are underpopulated: Per the guidelines of BLM’s own geneticist, 83% of the herds suffer from arbitrary management levels (AMLs) set below minimum-viable population (MVP). Low AMLs enable BLM to claim an “excess” in herds whose numbers, even if they were over AML, would still not reach MVP. So being “over AML” is meaningless as well as misleading. But the low AMLs, combined with falsified, biologically-impossible herd-growth estimates, give BLM an excuse to scapegoat those few wild horses for the range-damage done by the millions of livestock that overgraze the public lands. Whose grass? In fact, it is the livestock who are eating the wild horses’ grass. Some background — the dedicated wild-horse habitats cover only 11% of BLM land. Cattle are allowed to graze about 5 times that much, including within all but 4 of the wild-horse herd areas. Yet in those official wild-horse habitats where livestock are given allotments, the mustangs are restricted to 18% of the forage while the cattle get 82%. Bogus billion: The wild horses being held in captivity are the “legacy” of former Secretary Salazar’s equid cleansing era, during which he had thousands of wild horses removed from the range. However, the mortality rate of captive wild horses is about 8% a year. So, obviously, since they are not reproducing, their numbers will steadily drop, showing that BLM’s billion-dollar figure for their care is just another Lie. The Wild Horse and Burro program, if run per the minimum-feasible management-model specified by Law, would not cost much at all. BLM does not lack for resources. There are 22 million acres of legally-designated wild-horse herd areas — which BLM previously took away for expediency — that can be reopened as habitat. The horses now held captive can be released to those areas, where the cost of their upkeep will be $0. Adoptions: Have not declined. It’s just that BLM used to count sales-for-slaughter as “adoptions.” Now, only “forever-family” placements qualify. However, wild horses are not homeless horses. They have a home — where they belong — on the range. Persecuted predators: Contrary to BLM’s disinformation campaign, wild horses do have natural predators — mountain lions, bears, wolves, and coyotes. But those predators are persecuted mercilessly. The government exterminates what the hunters don’t shoot. However, the International Society for the Protection of Mustangs and Burros — Wild Horse Annie’s foundation — notes that even without predators, wild-horse herds self-regulate their numbers, with population-growth in the single digits. Science and Conservation Center: Is the manufacturer and distributor of PZP / ZonaStat-H. Thus, its information is not impartial. 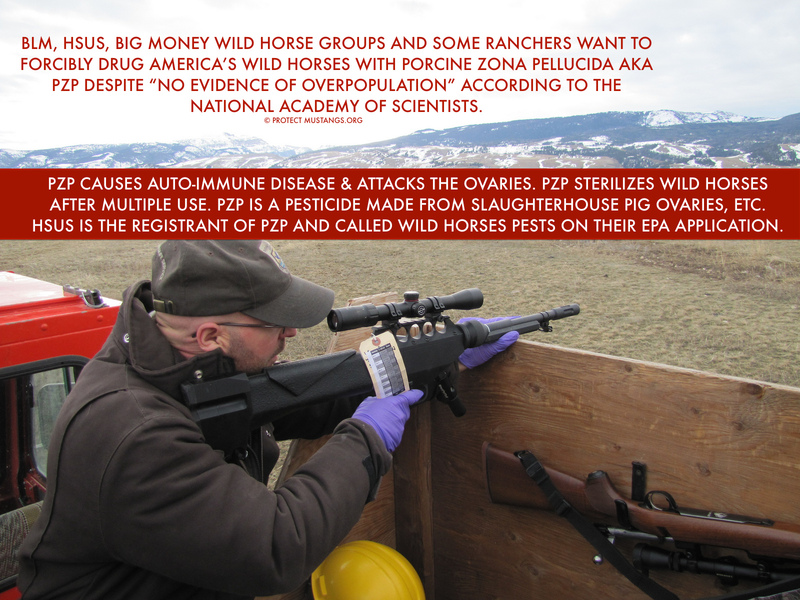 PZP is a registered pesticide that was approved by the EPA for use on wild horses and burros “where they have become a nuisance.” However, PZP was registered without the standard testing requirements. There is currently a lawsuit challenging the legitimacy of the registration, especially in light of studies that have disclosed PZP’s many adverse side-effects. Shooting wild horses: PZP is a potent weapon in BLM’s arsenal — for its biological warfare against the wild horses. But birth control for wild horses is unnecessary because there is no overpopulation. Why would we contracept herds whose population is inadequate for genetic viability? Why would we contracept herds based on falsified figures? Logically we wouldn’t and ethically we shouldn’t. Further, if PZP were going to stop the roundups, it would have done so long ago for the Pryor Mountain herd, which has been darted with PZP for nearly two decades. Yet roundups have been scheduled there like clockwork every 3 years and, in spite of intensifying the PZP treatments recently, BLM tried to implement yearly roundups until stopped by a Friends of Animals lawsuit. PZP — the anti-vaccine: PZP causes auto-immune disease. PZP “works” by tricking the immune system into producing antibodies that target and attack the ovaries. The antibodies cause ovarian dystrophy, oophoritis (inflammation of the ovaries), ovarian cysts, destruction of oocytes in growing follicles, and depletion of resting follicles. The mare’s estrogen-levels drop markedly as PZP destroys her ovaries. Ultimately, PZP sterilizes her. Because PZP stimulates the immune system, it ironically works “best” — sterilizes faster — in mares that have strong immune-function. Such mares respond to the anti-vaccine and produce quantities of PZP antibodies that destroy their ovaries. But, conversely, PZP may not work at all in mares whose immune-function is weak or depressed. Those mares fail to respond to PZP. They keep getting pregnant and producing foals who, like their dams, suffer from weak immune-function. So, the PZP pesticide works against the very horses that Nature has best equipped for survival-against-disease while favoring and selecting for the immuno-compromised. Worse yet, radioimmunoassay tests indicated that PZP antibodies are transferred from mother to female offspring via the placenta and milk. Health-risks to volunteers: As for the well-meaning volunteers who dart wild horses, EPA’s Pesticide Fact Sheet for PZP advises that Personal Protective Equipment requirements include long sleeved shirt and long pants, gloves and shoes plus socks to mitigate occupational exposure. EPA specifically warns that pregnant women must not be involved in handling or injecting ZonaStat-H, and that all women should be aware that accidental self-injection may cause infertility. Unfortunately, PZP’s manufacturer has misrepresented PZP as “so safe it is boring.” But research shows that PZP is a powerful hormone disruptor. Further, consider the magnitude of the risk — the PZP-in-question is a horse-size dose. If volunteers think PZP is safe, they will be less likely to protect themselves from this dangerous pesticide. Indeed, please note that in the photo accompanying your article, Ms. Bolbol is not in compliance with EPA’s safety-precautions. She is not wearing the required protective gear. Mengelian experiments: Now, BLM wants to perform diabolical sterilization experiments on these equine POWs to develop a Final Solution to the “problem”. BLM is handing out $11 million for sterilization-studies. The grant money is surely intended to buy loyalty and silence potential criticism from academia. Plus, BLM, a corrupt agency, gets to cloak itself in respectability by affiliating with prestigious universities. The ugly side of PZP is humane-washed by feel-good features that describe it with humor, sweetness and light. However, the true story of PZP is one of scandal, whose deceit and danger — to both horses and humans — must be exposed. That is the story that needs to be reported. This mare waits in the alley before being led into the chute where her age and body condition will be checked. After being treated with the PZP fertility control agent, this mare will be released back to the Owyhee HMA. The pro-slaughter, pro-experiment on pregnant mares, pro-sterilization, pro-pzp advocates are posing as horse advocates in the “Sinister Solutions” group on Facebook. They broadcast the BLM agenda on their Facebook page sprinkled with BLM employees. It’s like an endless biased talk show. They bash and lie about real advocates championing the rights of America’s wild horses and Facebook lets them do it. Several members of Sinister Solutions started a new group to lead the smear against us, the WY14™ and Protect Mustangs™. They are spreading lies, bashing, bullying and harassing us. They want to hurt the March pasture board fundraiser for the Wyoming 14™ (WY14™) https://www.gofundme.com/MustangPasture3-16 and they want to hurt the wild horses. The sinister group launched a Facebook page to find the WY14™ in their private location so they would lose their safety. Now their location has been disclosed to many pro-slaughter people. What is the real motive of the group run by BLM supporters? Several haters and jealous people also joined the Facebook group to be part of the hate-fest. Their goal is to hurt donations for the WY14™ so the orphans of slaughter can’t pay their pasture board for March. They are trying to put them at-risk. These online bullies are not only hoping for neglect but they are interfering in our program and work. It seems they are also threatening to cause harm. The pro-slaughter, pro-sterilization advocates are plotting to “swoop in to take them”. . . But we aren’t going to let that happen. If you are hearing lies about missing horses or anything else, please call me and ask any questions. My number is 415-531-8454. You can also email us at Contact@ProtectMustangs.org All the members of the herd known as the WY14™ (14 + 2 foals) are fine and well cared for on a daily basis. Craig Downer, wildlife ecologist, will attest to that. You can read his report here. You will remember that I spoke about the one mustang who escaped during loading from the layover sanctuary last August. His name is White Socks and he was invited to stay at Dreamcatcher for the winter. The haters and pro-slaughter people have been spreading lies to create hysteria that he was missing when we had already told supporters he was there. They even went as far as to violate copyright laws to harass and bully us. This is vicious, illegal and there’s more to it. The WY14™ are sad that their peaceful eco-pasture has been ruined by stalkers with telephoto cameras posting smears on Facebook, spewing jealously, hatred and bad energy. The WY14™ were starting to get better after all the trauma from the BLM roundup where everyone over the age of 2 was killed at slaughter for human consumption. Now they are being persecuted again. . .
Keep in mind all this is happening when a few members of the WY14™ are going to contribute foals. 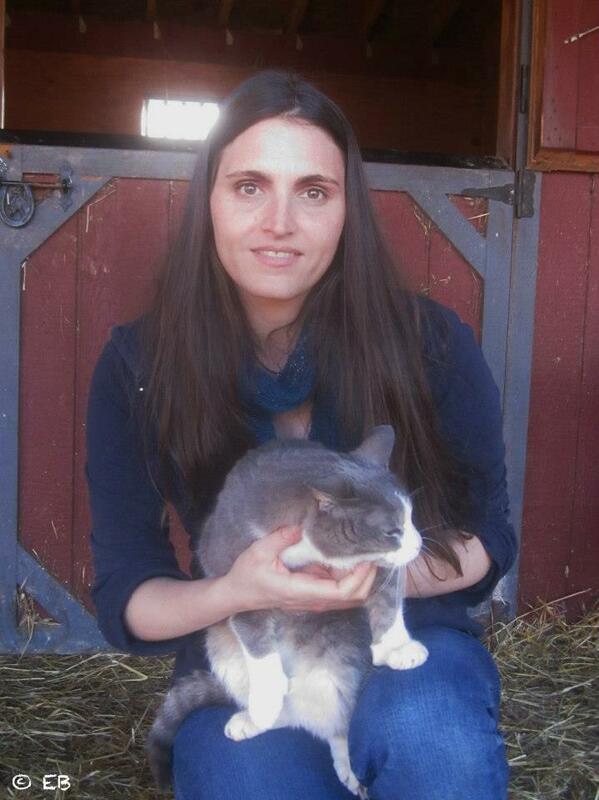 These fertility-haters are spying on the pregnant mares, making false claims to animal welfare agencies and then rushing off on Facebook to spread gloom and doom about their pregnancies, calling them “rank”, “inbred”, and “ugly”, etc. This is so wrong. Right now the WY14™ need your help to share and donate for their March pasture rent. Please help them here: https://www.gofundme.com/MustangPasture3-16 Please share often so others can help donate too. This makes a big difference. Please keep the WY14™ in your prayers and PRAY we find the land for their permanent Eco-Sanctuary in California ASAP. This is an emergency now! Below Susan Humphrey shares her view on wild horses–calling them feral and pests. http://magicvalley.com/news/local/utah-wildlife-board-urges-blm-to-remove-some-wild-horses/article_9721b046-d207-11e3-964d-001a4bcf887a.html Below Susan Humphrey is speaking about Anne Novak, Executive Director of Protect Mustangs in a public Facebook group. But herd-growth is unlikely to reach even 20 percent a year. It is important to understand that the birth-rate is not the same as–and should not be equated to–the population growth-rate. Here’s why: Horses die. An independent study reviewed BLM roundup-records for a representative sample of four herd management areas composed of 5,859 wild horses (Gregg, LeBlanc, and Johnston, 2014). While the researchers found an overall birth-rate of just under 20 percent, they also found that half of foals perish in their first year of life. Thus, the effective foal-to-yearling survival-rate is just 10 percent. Further, adult wild horses also perish. They succumb to illness, injury, and predation. Their death-rate must be taken into consideration as well. But BLM ignores mortality–foal and adult–in its population-estimates. Given the 50% foal mortality-rate, and the 5% or higher average annual death-rate of adult wild horses, herd-growth could not increase 20% a year, and a herd-population could not double in 4 years–refuting yet another BLM myth. Stealthily inserting bogus birth-rates into the data, wrongly conflating birth-rates with population growth-rates, and failing to factor in mortality-rates–that is how BLM creates the false impression of a population-explosion. But “cooking the books” is not the only way BLM falsifies the population-picture. Another ruse BLM employs is restricting maximum herd-size below minimum-viable population (MVP) size. Then, whenever a herd is made to appear–via fictitious figures–to exceed the arbitrary management level, BLM screams “excess!” and declares an immediate need for mass-removals and sterilizations. It should be noted that more than 70 percent of the herds are “managed” below MVP. BLM also fails to consider another factor limiting herd-growth–stochastic events–which are random catastrophes such as wildfires or contagious diseases that suddenly wipe out mass-numbers of herd-members. Stochastic events can result in no-growth or even negative growth. Now BLM is distributing grant-money to universities and researchers to study more ways of dealing with the phantom overpopulation. All manner of sicko experiments are being carried out on the wild horses, such as treating them with endocrine disruptors and sterilizing them surgically. Why? Because BLM is a corrupt agency. It invented this counterfeit crisis to create a sense of urgency, which will pressure Congress to give the Agency extra money to “solve” a non-existent problem. 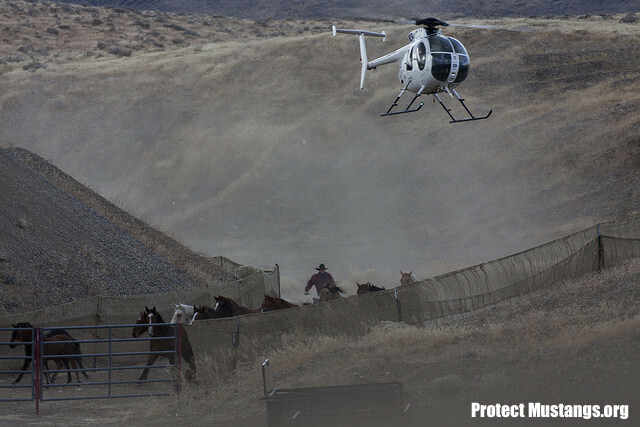 Visit www.ProtectMustangs.org for more information and click on the donate button help fight the injustice! You can make a difference. Using simple division to calculate the average increase is how most people would “do the math”–dividing the percentage increase (643%) by the number of years (4). Expressing the average that way is readily understandable. However, another way of calculating it is what is called the “compound annual growth rate” (CAGR). Per that method, herd-growth can be likened to compound interest that you earn on a savings account; except of course that horses do die, which complicates the computations. But for now, let’s assume that horses never die, because that’s the assumption that BLM makes. Using the free, online CAGR tool linked below, you would enter Kiger’s beginning population–21–and its alleged ending population–156–and the number of years that had passed–4. Then press the “Calculate CAGR” button, and the tool will compute the compound annual growth rate. For the Kiger herd, the CAGR is 65%, which is “only” 3.25 times higher–instead of 8 times higher–than 20%. Here are the other herds cited and their CAGRs. Fish Creek stays the same because its growth is just for one year. * BLM’s population-modeling criteria said foals were not included in the AML. Evidently, they were. At the link below, you will find a discussion posted by the University of Oregon, providing a comparison between the simple average and the compound annual growth-rate methodologies for calculating annual percentage population-growth. The compound annual method, on the other hand, is extraordinarily complicated to compute, which is why the online tool is almost a necessity. What is important is that both are legitimate ways of describing the data. It should be kept in mind that population-growth estimates must consider births and deaths, not just births. That’s one reason why the Gregg et al. study was so important — it established, per BLM’s own documentation, a slightly-less than 20-percent birth-rate and a 50-percent foal mortality-rate. So, a wild-horse herd growth-rate of, for example, 65%, would have to mean a birth-rate that was much higher than 65% to offset foal deaths (50%) and adult deaths (5%). Is PZP causing young fillies to be raped by mobs of studs? JOIN the Forum on PZP https://www.facebook.com/groups/ForumPZPWildHorsesBurros to learn the TRUTH about PZP (Native, 22, etc.) Once informed people can’t support PZP and that’s why the PZP Pushers are trying to hide the information. MINDEN, NV (January 22, 2015)—Edita Birnkrant, Campaigns Director for Friends of Animals (FoA) flew out from New York City with FoA correspondent Nicole Rivard to give public comments at the Bureau of Land Management (BLM) public meeting about the Carson City District Draft Resource Management Plan which calls to zero out 6 treasured herds of wild horses. After being denied her rights at the public meeting, held at the Carson Valley Inn in Minden, Nevada this afternoon, Birnkrant took over the microphone at the BLM meeting and held up yellow crime scene tape while Rivard filmed the protest against censorship and managing wild horses to extinction. Birnkrant was threatened with arrest by Nevada Sheriffs while holding up her banner. The hotel manager made Rivard stop filming and told the advocates they were being thrown out of the hotel, even though they had booked rooms there that night. “While we were waiting to go into the meeting a man told a BLM staffer “I wanna open up a horse butcher shop”. Then a few other guys started making jokes about how tender horse meat is. The BLM guy just chuckled but didn’t tell them it was inappropriate. I was outraged that the BLM dared to hold a “public ” meeting and forbid the public from speaking. I took over the microphone to call out the sham of a BLM meeting, that shut out the public, and I said that Friends of Animals was there tonight to oppose the BLM’s extinction plan for wild horses in Nevada. I said the BLM is managing wild horses to extinction through roundups and PZP and we are outraged and demand it stop. I held our banner that said “Stop the BLM’s Criminal Reign of Terror. Protect Wild Horses Under the Endangered Species Act” The sheriffs were surrounding me at that point threatening to arrest me unless I left. I still had the banner and was shouting “the BLM is charged with crimes against wild horses”. Then the hotel manager at the Carson Valley Inn in Minden, Nevada—Phil Dohrn–started bullying us and got in Nicole’s face. He pushed against her—blocking the camera and told her she had to shut her video off and we were getting thrown out. The federal plan for public land in the Reno/Carson area is of interest to all Americans from coast to coast. Citizens care about public land and want federally protected wild horses protected by the law that allows them to roam freely without harassment. 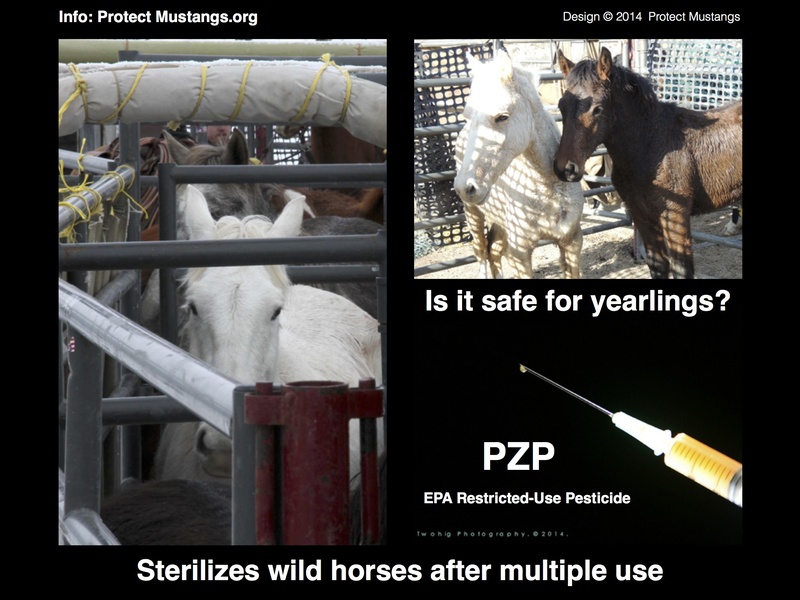 PZP is an EPA approved restricted-use pesticide (http://www.epa.gov/pesticides/chem_search/reg_actions/pending/fs_PC-176603_01-Jan-12.pdf) that sterilizes wild mares after multiple use. Americans are learning about the dangers of PZP and are outraged the BLM would allow this to be used on wild horses. The opinion of the American public, as declared through Congress is clear: “wild free-roaming horses and burros are living symbols of the historic and pioneer spirit of the West; they contribute to the diversity of life forms within the Nation and enrich the lives of the American people.” BLM has an obligation to consider wild horses as an integral part of the natural system of public lands. It appears from the Carson City’s Draft Resource Management Plan (RMP) and Environmental Impact Statement that the BLM failed to take into consideration critical information about wild horses and failed to consider any alternatives that promote a free and viable wild horse population. Friends of Animal is here to urge BLM to reevaluate its Resource Management Plan. We ask that BLM consider an alternative that: (1) maintains all wild horse herd management areas; (2) prohibits conflicting uses on herd management areas; and (3) prohibits efforts to eradicate wild horses, such as round-ups, fertility control and sterilization. BLM must take into consideration the small population of wild horses and the potential that they will be listed as a threatened or endangered species under the Federal Endangered Species Act. From a scientific perspective, wild horses on our public lands are at risk of extinction if BLM does not change its management plans. BLM does not provide adequate area for wild horses. Under the current RMP, approximately 4.8 million acres of public lands covered by the plan are open for private ranchers to graze cattle and sheep while only 1.2 million acres are reserved for wild horses. In the preferred alternative the ratio or area available for cattle and sheep grazing is also more than 4 times that available for wild horses. Moreover, under no alternative, are cattle and sheep prohibited from grazing on wild horse herd management areas. BLM must consider an alternative that provides contiguous habitat for wild horses to roam freely. The Equid Specialist Group of IUCN Species Survival Commission recommends minimum populations of 2,500 individuals for the conservation of genetic diversity. Others have warned that populations managed with a target size of fewer than 500 horses are at some risk of losing more than 90 percent of selective neutral genetic variation over a period of 200 years. There are no herds that have a large enough population to meet the recommendation of the IUCN Species Survival Commission – 2,500 animals—and only 1 out of 17 of the herd management areas in this planning area has an appropriate management level set to 500 or more. Limiting horses to an artificially low number is short-sighted and ineffective because it could prompt short-term population growth. Finally, Friends of Animals submitted a petition to the US Fish and Wildlife Service asking it to recognize wild horses as threatened or endangered. The Endangered Species Act requires the government to make final determination on the petition within 12 months – which would be this June. The BLM should not undermine this legal process by allowing BLM to round-up and remove wild horses from Carson City herd management areas. Not only would such actions undermine the Endangered Species Act, but they would also put the viability of the horses here at risk. Instead the plan should recommend BLM halt all efforts to remove wild horses, and allow Fish and Wildlife Service to review the law and facts in regards to wild horses. As my colleague just pointed out, all but one of the 17 herd management areas in the Carson City District has an appropriate management level set to 500 or more. Everywhere else the loss of genetic viability is a real concern. So additional roundups, which destroy social structure that can lead to population spikes, as well as consideration of administering fertility control, should be removed from this Carson City District Plan immediately if not sooner. While some wild horse advocates may claim fertility control drugs, such as PZP, is the lesser of two evils, we at FoA believe birth control is equally harmful and inhumane as roundups. In most cases—even the BLM admits this—wild horses would still have to be captured to be treated with the pesticide before being released. The widespread use of PZP is really very contrary to the true core intent of the Wild Horse and Burro Act of 1971, which was to restore wild horses as naturally, integrated, harmonious components of the public land ecosystem who are not overly tampered with. Deciding which animal should give birth or not is a very invasive, unacceptable thing to do to these wild animals. Studies have revealed adverse effects of PZP— that it sterilizes wild horses after multiple uses and results in risky foal birth out of season and significant behavioral changes that can affect the health of the herd. BLM’s discussion regarding a population control program in the EIS is inaccurate and unsupported. They claim fertility control limits the stress of pregnancy on mares, and helps stallions as they will not be exerting extra energy fighting to control mares or raising foals. What about the stress on mares of not being able to get pregnant as nature intended! We urge the BLM to look beyond data provided by the Humane Society of the United States, which has a vested interest in PZP as it is the registrant of the pesticide, and Jay Kirkpatrick, the director of the Science and Conservation Center, which produces the active ingredient in PZP. For instance a 2009 Princeton University study of the horses on Shackleford Banks in North Carolina, who began getting PZP in 2000, showed that prolonged infertility has significant consequences on social behavior. Researchers found that females who were receiving contraception were much more likely to change groups. Normally bands are really very stable, said researcher Cassandra Nunez, and mares will stay with males much if not all of their lives. That stability is really important for the health of the group members. Foal mortality increases when there are a bunch of different changes, and parasite load of animals in the group can go up because they are getting more stressed. In a later study in 2010, Nunez found that recipients of PZP also extend the receptive breeding period into what is normally the non-breeding season, resulting in foal birth out of season. Normally the winter is spent eating as much as they can, and everyone is more relaxed. Males tend to let females roam farther, which is good because food is patchier. So all of this is changing because of extended cycling. It is imperative that BLM reduce the number of cattle and sheep allowed to graze on public lands, as well as consider holistic resource management plan, such as reserve design, which is described in detail in Craig Downer’s Book the Wild Horse Conspiracy. Both options would adequately protect these majestic animals so that they can persist for future generations. Carson City, Nev. – The Bureau of Land Management (BLM) is asking the public to review and comment on a Draft Resource Management Plan (RMP) and Environmental Impact Statement (EIS) for the Carson City District. The draft plan will affect approximately 4.8 million acres of public land. The comment period opened with the publication of a notice of availability in the Federal Register on November 28, 2014. Comments will be accepted during a 120-day period which closes March 27, 2015. 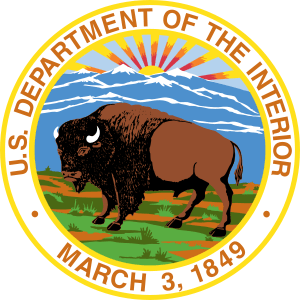 Public meetings to review and comment on the draft EIS will be announced at least 15 days in advance in local newspapers and on the BLM website. The plan will address: Areas of Critical Environmental Concern, lands and realty, utility corridors, wind energy, travel management, recreation, fish and wildlife, minerals, wild and scenic rivers, public health and safety, and visual resource management. Public meetings on the Draft RMP/Draft EIS are currently scheduled for 5:00 to 7:00 p.m.; on January 13, at the John Ascuaga’s Nugget (1100 Nugget Ave.) in Sparks, Nev.; on January 15, at the Fallon Convention Center (100 Campus Way) in Fallon, Nev.; on January 20, at the Mineral County Library (First & A Street) in Hawthorne, Nev.; on January 22, at the Carson Valley Inn (1627 US Hwy 395 N) in Minden, Nev.; and on January 29, at the Yerington Elementary School (112 N. California St.) in Yerington, Nev. An additional public meeting will be held from 2:00 to 4:00 p.m., on January 24, at the Carson City Plaza Hotel and Event Center (801 South Carson Street) in Carson City, Nev. Additional public meetings are anticipated in coordination with local County Commissions and Boards of Supervisors. • Mail: BLM Carson City District, Attn: CCD RMP, 5665 Morgan Mill Rd., Carson City, NV 89701. Join the open forum: Using PZP on federally protected wild horses and burros, is it safe?